The Thanksgiving season is approaching fast, and you know what that means – more time with your family. Anthony For Men knows that sometimes reuniting with your family can be a drag and that family members can spend an inordinate amount of time critiquing your face – your father tells you that you look tired, your mom says your face has gotten thinner (or not), your siblings are always in your face and your grandparents constantly touch your face. So, with all this fun-loving face time with family, we thought it’d be fun to spend some time talking about a certain TV family’s faces – the men of Modern Family. We may not have the solution to Manny’s grown-man syndrome or Phil’s delusional over-estimation of himself, but we do have an opinion on what Anthony For Men products would work well for them. 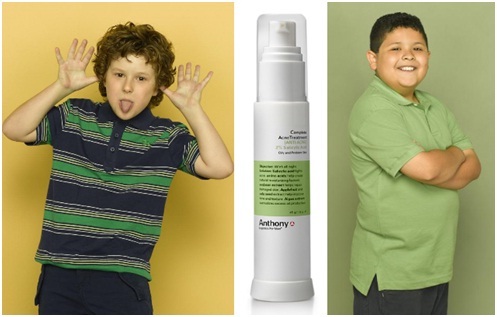 Anthony For Men does their best family impression and starts analyzing the faces of Modern Family. 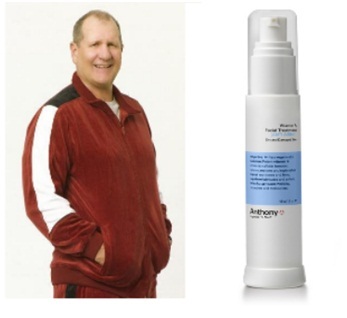 First we look at the patriarch of the family – Jay Pritchett. He’s over 60 years old and has developed a few wrinkles over the years. And with family members like a strong-willed Columbian wife, a 10-year-old stepson who likes lattés over jungle gyms, a high-strung daughter who is mother to his 3 one-of-a-kind grandchildren, a homosexual lawyer son, and worst of all, in-laws, you’d probably have a few too. That’s why Anthony For Men knows that the perfect solution to aging would be Anthony Logistics For Men Vitamin A Treatment. It’s got powerful ingredients like a healthy dose of Vitamin A to repair skin, increase elasticity and bring texture back to the skin. Carrot Root is used to tone and firm, while Shea Butter will moisturize and smooth out even the toughest family-influenced wrinkles. We know Jay has a tough-guy exterior, but his skin shouldn’t be tough. The Vitamin A Treatment will help. 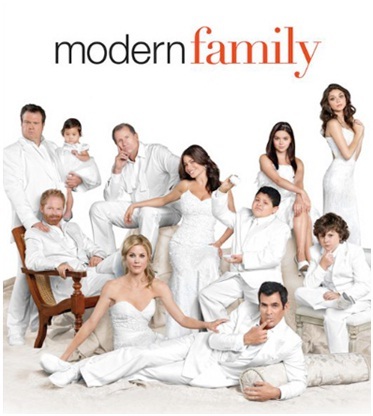 Phil Dunphy is the father of Jay’s grandchildren, Haley, Alex and Luke, and husband to Jay’s daughter, Claire. He’s the self-proclaimed “cool dad” and is very proud of it. That means his “peerenting” tactics, as he puts it, are lax, relatable and, let’s face it, mostly irresponsible. But his laid-back persona shows in his youthful appearance. That 5 o’clock shadow he sports also shows pretty often too, which is why using Anthony Logistics For Men Shave Cream is ideal for this goofy dad. Phil might have gotten away with the look as a former cheerleader for his college, but as a real-estate agent he needs to look professional and Shave Cream will help. It’s the perfect complement to Phil’s goofy persona; it lightly absorbs and is sensitive to the touch. Sadly for him though, it doesn’t foam (so no pretending he has rabies to prank Luke). It does however have great ingredients like Eucalyptus Oil that heals, Squalene to lubricate, Aloe Vera Gel that soothes and tons of vitamins that nourish and replenish skin. Phil might never get around to fixing the broken step on his staircase, but he can fix stubble on his face with Anthony Logistics For Men Shave Cream. Mitchell Pritchett is Jay’s lawyer son. He’s in a loving gay relationship with his partner, Cameron, and together they are now parents to an adopted baby named Lily. Mitchell is usually the yin to Cameron’s yang, meaning he’s very low-key and mild-mannered but will speak out when provoked, although not always thought-through. He quit his lawyer job almost on a whim. One thing you will also notice is that Mitchell sports a pretty well groomed beard. Anthony For Men knows that an epic beard like his must take a lot of maintenance. That’s why we made Anthony Logistics For Men Shave Gel. It’s specifically made for precision shaves on facial hair. It’s got state-of-the-art see-through technology so that you can target exactly where to shave and see how it looks as you’re shaving. It’s also equipped with ingredients that soothe and smooth like Slippery Elm and Glycerin. Jury’s out Mitch; Anthony Logistics For Men Shave Gel is perfect for his bearded work-of-art. Cameron Tucker is Mitchell’s life partner and that’s about where the similarities between them end. Cam, as he’s known, may be a stay-at-home dad to Lily but isn’t limited to just that. To say that Cam is a bit of a renaissance man might be the understatement of the year. He’s knowledgeable in a variety of disciplines like Japanese flower arrangements and antique fountain pens, while also being a drummer and once being the starting center for the University of Illinois football team. So it’s hard to say with his larger-than-life personality and can-do spirit that nothing really fits for Cam, but the question remains what would be the best product for him? 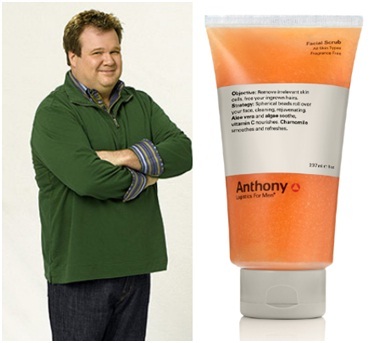 The answer: Anthony Logistics For Men Facial Scrub. It gets comical the longer the eccentric list of Cam’s talents gets, but he’s also a trained Auguste clown. That means his face takes some punishment from all the makeup and adhesives he applies. And that’s why Anthony Logistics For Men Facial Scrub, made with spherical beads, will gently roll over and remove tough dead skin while keeping new skin soft. It’s easy when herbal ingredients like Chamomile are used as an anti-inflammatory and soothing agent. Cam might be a clown, but poor skin is no laughing matter. Luke Dunphy and Manny Delgado are the last remaining men of Modern Family and while both of them are children, you would only think one of them knew it. Luke is the rambunctious, sometimes troublesome often-times innocent son of the Dunphy clan while Manny acts like he’s older than Phil (bad example, that isn’t hard to do). Either way, both of them are at that prepubescent age and before they know it, they’ll be teens. This could only mean one thing – pimples! Anthony For Men wants them to be well prepared with good habits to prevent future breakouts and with knowledge on treating them. 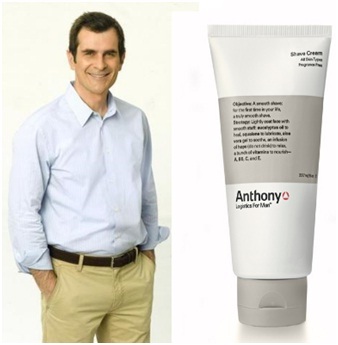 Anthony Logistics For Men Complete Acne Treatment will do just that. It’s got powerful Salicylic Acid, the key ingredient for fighting blemishes, to deep clean inside pores. Also, Cinnamon Extract acts as a natural astringent and antiseptic to clean the skin, while Glycerin counteracts strong ingredients to keep skin soft and hydrated. Luke and Manny might be different, but pimples don’t discriminate. Be prepared! Your family may be a bit more traditional than that of Modern Family, but one thing is for sure for all of us; around your family at Thanksgiving time, your face is being analyzed. So take the extra step and become a bit more modern yourself by using Anthony For Men’s grooming products. It might give your family one less thing to talk about.